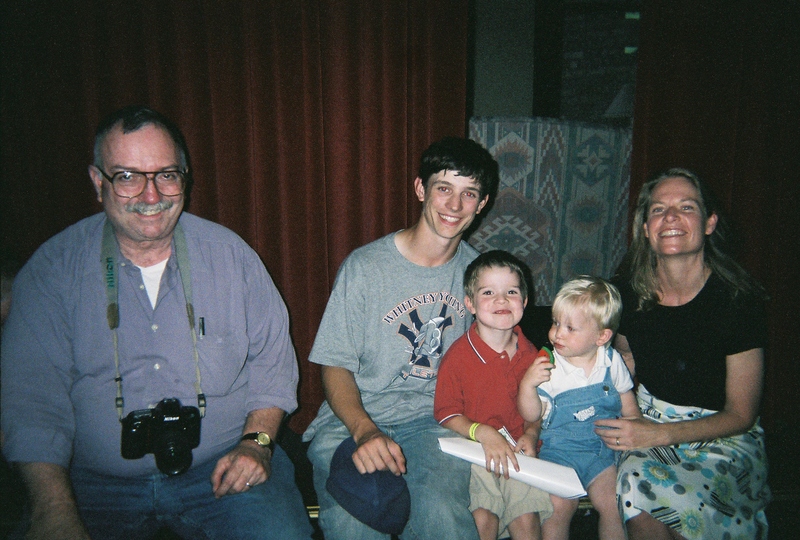 George sought happiness in marriage. Before we met, he had been wedded to two other women he loved. He married college classmate and fellow anti-war activist Linda Haase in 1970. 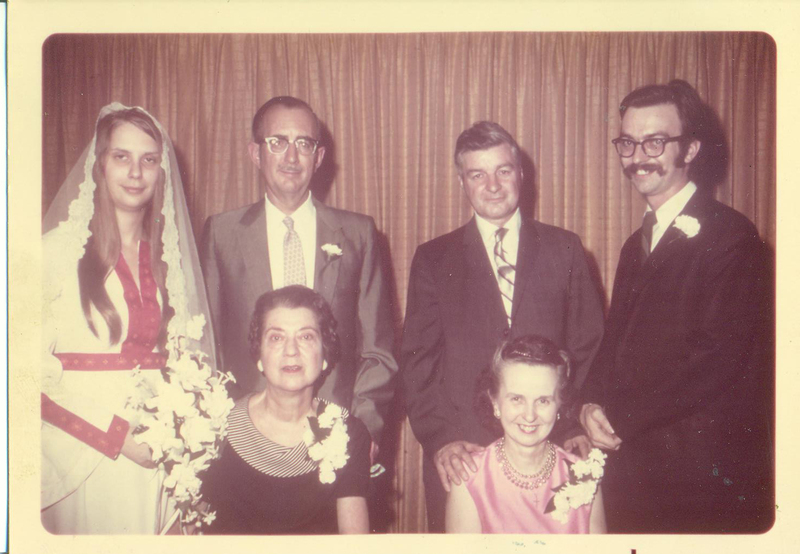 George and Linda Haase, pictured with their parents, married in 1970.After they had been divorced for several years, in 1988, he married Agatha Vasilescu, with whom he had his son, Daniel Corneilius, on May 1, 1989. 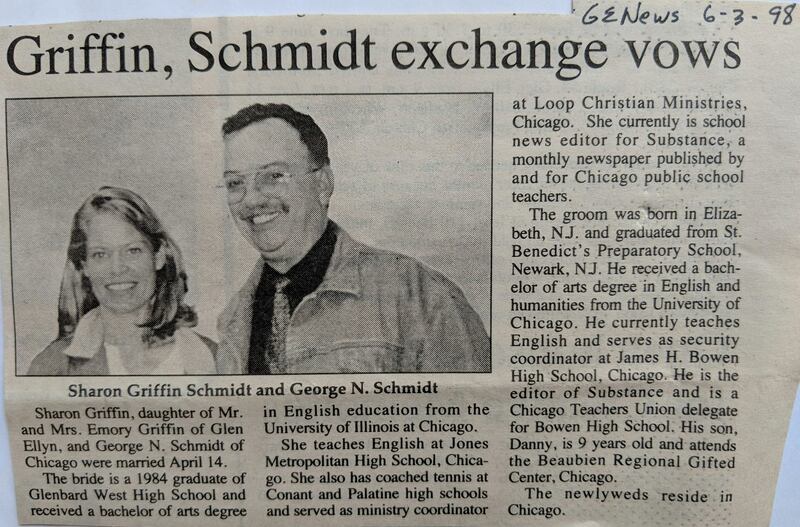 Dan Schmidt was born on May 1, 1989.Knowing George and friends he had from those years, I’m sure he was filled with hope and love and desire in both those marriages. 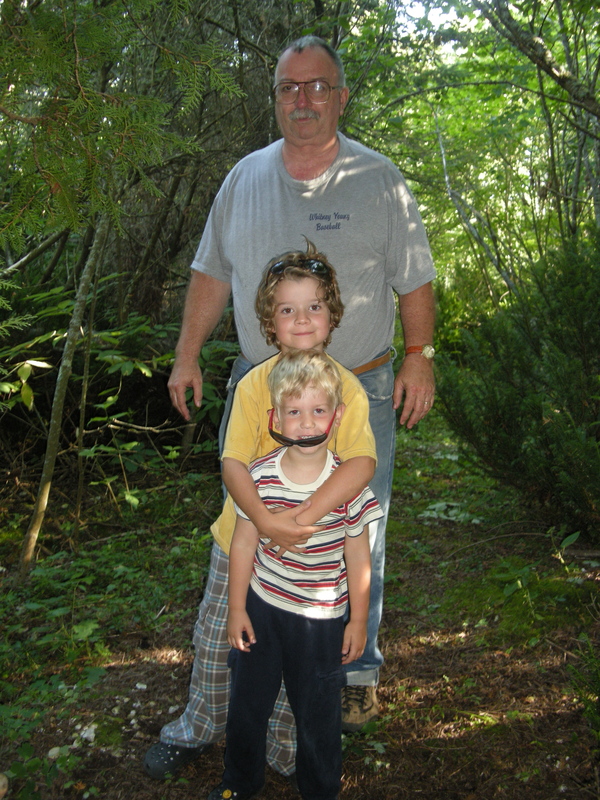 There are probably no words to describe his utmost joy in having a son, Danny, born when George was 43 years old. Dan and I recently bumped into a lengthy interview he gave in the spring of 2010 to Columbia College student Melena Nicholson Wright. The interview – which was part of a course, Oral History: The Art of the Interview in the Humanities, History & Social Sciences department, focussing on “members of the Chicago community who participated in local protest organizations against the apartheid movement in Africa” – also covered many more areas of George’s life of activism. Toward the end of the long discussion, Ms. Wright asked George: “Looking back now, what would you have done differently?” While George doesn’t speak specifically about his ex-wives, he talks about making mistakes with people around him when he became focussed on his work. The thing is, for me and probably others close to him, George’s intense focus and tunnel vision, which may have caused problems in his relationships, were qualities that made him attractive. He was brilliant, passionate, and driven. This is why we loved him. I first knew him by his writing and publication of Substance, which was brought to teachers at Jones Commercial High School, where I was teaching, by our CTU delegate Marilyn Wharton. From the time we met, when I became a reporter for Substance, until his illness, I was impressed by his intelligence, unwavering commitment to the truth, leadership abilities and wealth of experience. He seemed to know everything; he was an excellent teacher, always willing to share his knowledge. 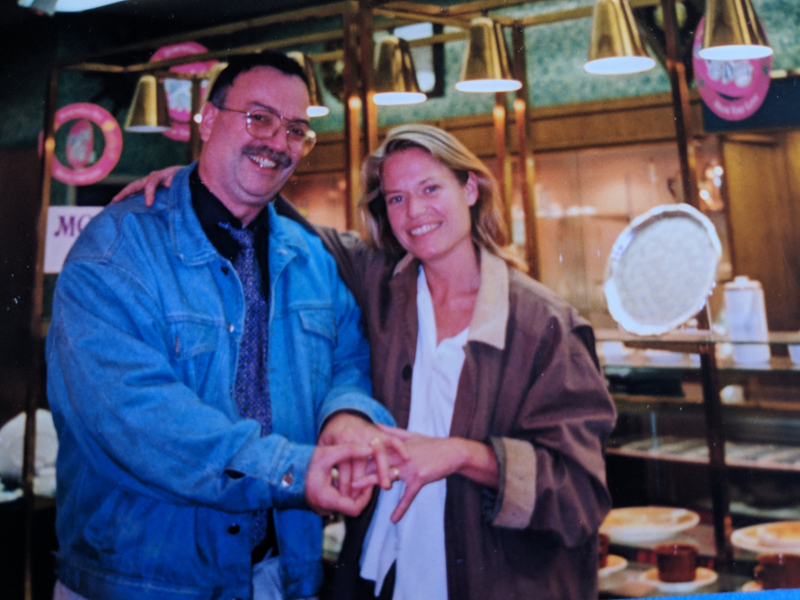 Glen Ellyn News wedding announcement"You’re in trouble because you married a great man,” my Jones co-worker Tim Tutton said to me after George and I eloped. “It’s better to marry a good man, hard to live with a great one.” He guessed that things wouldn’t work out and told me if I experienced trouble in my marriage, he and his wife could put me up in a room above their bar The Hideout. But George was a good husband and easy to live with because he was always trustworthy and honest, always loving, always forgiving, always encouraging. He was the best companion because he was a great conversationalist. Besides his news writing and commentary, he was also an interesting and generous letter writer. He had so much to say and he wrote so well – poetry, too. George's third marriage was probably strengthened by our ages. He was 51 and I was 31 when we married. I was the oldest of any of George’s wives, he liked to tell me. Like him, I’d had time to learn from mistakes and had already survived some tough times when we got together. When we met, George had been listening to country music, including a song that repeated the lines: “Jesus and mama always loved me/ Even when the devil took control.” I don’t think George thought that the devil had ever had control of him or that he thought he’d had to turn anything around or had been on a wrong road like the guy in the song. But he believed the sentiment, that he and others are always worthy to be loved. April 14, 1998.He was in a somewhat settled place when I met him, resigned that he would not be the president of the Chicago Teachers Union. But, although he was without the youthful dynamism that friends remember from the 70s and 80s, he was still in the prime of his teaching career, successfully publishing Substance, which had reorganized into a legal corporation, organizing teachers within the union, and most importantly, happily and fully invested in caring for Danny as a single dad in a joint parenting agreement. 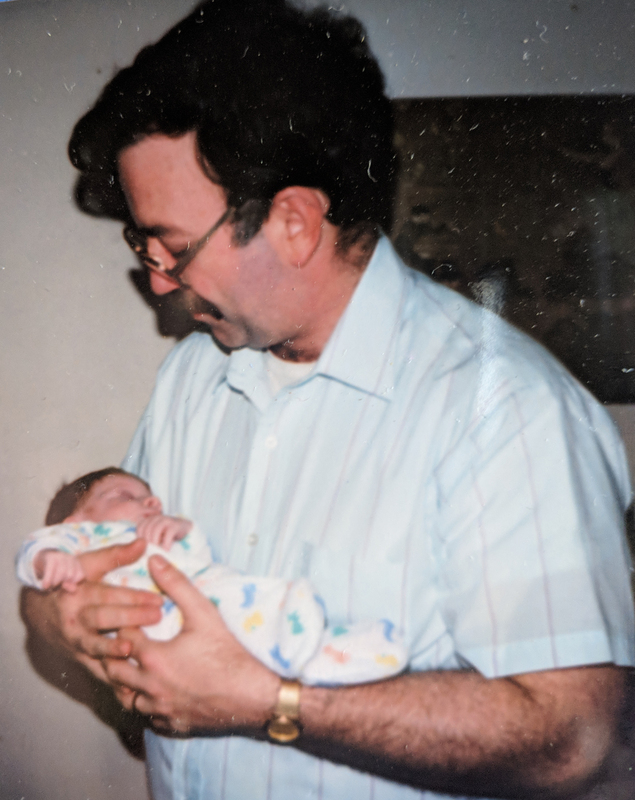 While he cared about many issues and people in the world, foremost was his family, educator and author Susan Ohanian reminded me in a recent email.